If you’ve noticed a police presence at Sibley and Vining Roads in Huron Township as of late, it’s because police use the area to enforce spring weight restrictions, commonly referred to as frost laws. “The state has enacted the frost law weight restrictions for truck traffic. These start and end dates are controlled by the state and county. We are unsure of the end date at this point,” said Everette Robbins, Huron Director of Public Safety. 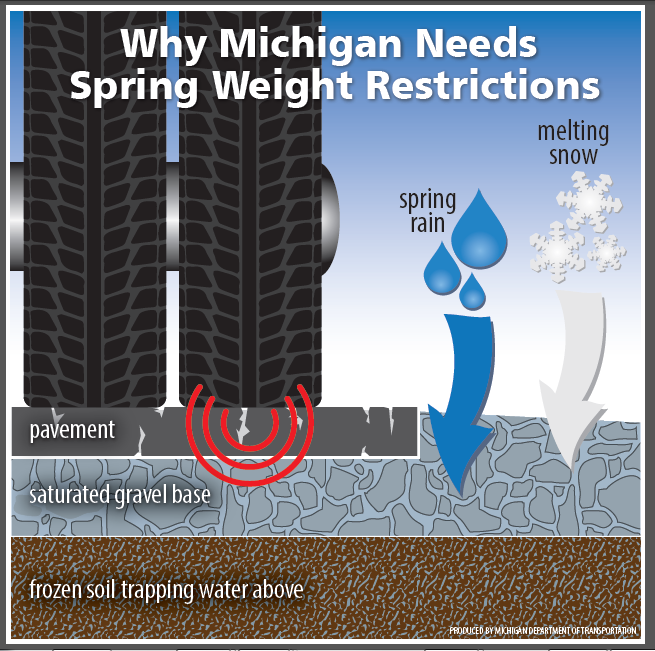 This infographic from the Michigan Department of Transportation explains why spring weight restrictions are important for the health of roadways. “Sibley and Vining is the area that most of the truck weighing is taking place. We are routing the truck there to be weighed as it is a safe way for the officers to do it,” he said. This entry was posted in Front Page News, Police & Fire on March 26, 2019 by Scott Bolthouse. State Rep. Abdullah Hammoud (D-Dearborn) announced last week legislation that would lower Michigan’s blood alcohol concentration threshold and would require ignition interlock devices for all first time convicted drunk drivers. The bill would lower the state’s drunk driving limit from .08 blood alcohol concentration to .05. The only state that requires a BAC that low is Utah. According to officials, studies show impairment at BAC levels below .08 is significant, adding seconds to response time, and in the case of traffic scenarios, is often the difference between life and death. According to the Michigan State Police, alcohol and drug-related fatal crashes remain a major traffic safety issue, with approximately 44.9 percent of total fatal crashes related to alcohol or drug impairment. A .05 BAC would result in an estimated 11 percent decline in fatal alcohol crashes and save approximately 1500 lives annually in the United States, according to MSP. Studies also show an interlock device is more effective than a suspended license alone, as 50-75 percent of convicted drunk drivers continue to drive on a suspended license. Hammoud was joined at the press conference by representatives from a number of groups, including Helen Witty, national president, Mothers Against Drunk Driving. This entry was posted in Front Page News, Government, Police & Fire on March 26, 2019 by Scott Bolthouse. Dramatic body camera footage shows Huron Township police officer Adam Sheehan enter a burning house Wednesday morning to save a woman from inside. When Sheehan arrived to the house, flames were erupting from inside and smoke was filling the rooms as he searched for the woman. After finding the woman, she initially did not want to leave the house because of her seven cats that were still somewhere on the property. Sheehan was able to eventually get her outside to safety. This entry was posted in Front Page News, Police & Fire on March 21, 2019 by Scott Bolthouse. A few extra drinks will probably be flowing this weekend as St. Patrick’s Day will be on Sunday. Michigan State Police are warning all who plan to partake in the fun that authorities will be on the lookout for impaired drivers. Their advice to drivers: plan before you party. On Sunday, troopers will join their counterparts from across the country in the international traffic safety initiative called Operation C.A.R.E. (Crash Awareness and Reduction Efforts). Authorities suggest downloading a ride sharing app or programming a taxi service’s number into your phone before the festivities begin. March 17 has become one of the nation’s deadliest holidays. According to the National Highway Traffic Safety Administration, during the 2014 St. Patrick’s Day holiday period, more than a quarter of all motor vehicle crash fatalities involved drunk drivers. The early hours of March 18 were even worse that year. Between midnight and 5:59 a.m., nearly half of all crash fatalities involved drunk drivers. Additionally, from 2010 to 2014, almost three-fourths of the drunk-driving fatalities during the holiday period involved drivers who had blood alcohol contents well above the .08 legal limit, with 266 drunk-driving fatalities total. Drivers need to also keep an eye out for pedestrians who have had too much to drink. Walking while intoxicated can also be deadly, as lack of attention and coordination puts drunk pedestrians at risk of getting hit by a vehicle. This entry was posted in Front Page News, Other News, Police & Fire on March 15, 2019 by Scott Bolthouse.